1. I'm still on a John Waller kick from the other week. I've listened to his While I'm Waiting CD, oh, about a million times since then. Thanks for the tip, Cacey! We had 11 young knights running around the place. Many of the party game ideas were gleaned from this website (if you have any young knights of your own). I really love celebrating birthdays. They are a big deal to me because they represent life, the giver of it, and the blessings within it. 3. We had some very dear friends over this week for dinner and a movie. We watched the following almost-classic which we always enjoy very much. Thankfully it had been awhile since we had seen it so it was funny again. Before you look at the cover art, I would just like to say that it misresents the movie to some degree. The girl does not really make up the movie. It's pretty conservative as far as movies go. And, ok, I'm going to stop the disclaimers because I just like the movie and I think it's very funny. It was good to laugh and share an evening with friends who were, consequently, celebrating their 46th anniversary! Prayed you up this morning! Thanks again for the Waller CD...you're right, it's incredible! I'm enjoying John Waller songs more and more. I love your attitude on birthday parties. I'll try to remind myself of that when I have to plan for the next one. Thanks for sharing the John Waller song. I hadn't heard anything but the Waiting song, so I'm glad to hear another one. Sounds great! Ps 46: always worth reading over and over. Enjoy your weekend! I used a Psalm in my fave five too. I love love love the Psalms! That's a good hymn too. Thanks for the reminder about Luther's holiday tomorrow. I had thought about it on Tuesday, but had forgotten again. The music video was unavailable for me to watch :( Maybe later. . . I'll have to look up that movie on NetFlix, my husband likes old movies and I don't remember having seen that one. I love John Waller as well! He's an amazing artist! Happy Birthday to your Knight! I'd not heard of that film -- looks interesting! That is a tremendous hymn. 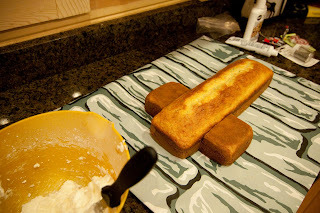 I would love to see your finished cake - that's so cool. And yes birthdays are great. Your attitude is very right. 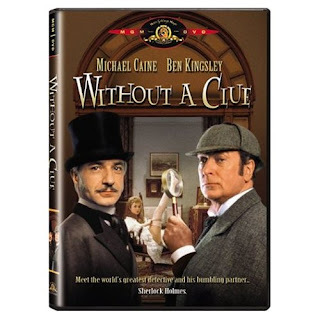 Oh my goodness...My husband and I watched "Without a Clue" for the first time several months ago and we laughed ourselves silly. What a funny "take" on the Sherlock Holmes movies. How nice to see it getting its due.